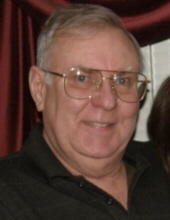 Age 74, of Bethel Park, formerly of Overbrook passed away at home, surrounded by family on January 30, 2019. James is survived by his beloved Wife, Ann O'Mara. Father of Katie (Jon) Kostuch and Sean O'Mara. Grandfather of Francesca Kostuch; Brother of Maureen (Keith) Briggs. James is preceded in death by parents Earl and Anna Belle O'Mara. James was a veteran of the US Air Force and a long time employee/retiree of General Motors. A visitation will be held on Monday, February 4th from 2pm - 4pm and from 6pm - 8 pm at JEFFERSON MEMORIAL FUNERAL HOME, INC., 301 Curry Hollow Rd., Pleasant Hills, 15236. In lieu of flowers, contributions may be made to the American Lung Association at www.lung.org. Condolences may be left at www.jeffersonmemorial.biz. To send flowers or a remembrance gift to the family of James E. O'Mara, please visit our Tribute Store. "Email Address" would like to share the life celebration of James E. O'Mara. Click on the "link" to go to share a favorite memory or leave a condolence message for the family.